Plenty more where these came from. Rep. John Mica (R., Fla.), top Republican on the Transportation Committee, criticized the administration for giving little of $8 billion in high-speed money to the Northeast. “They practically ignored the region of the country where high-speed makes the most sense – the Northeast Corridor,” he said. The corridor received $485 million, or 6 percent, of the stimulus funding. [Emphasis mine]. However, because we are the world and we are the future, some students at UPenn’s School of Design have proposed a radical alternative: a true, dedicated high-speed system that would make the journey from Boston to Washington, D.C. just 3.5 hours. From Philadelphia to New York in 37 minutes. This is the direction we want to go. This is more than just lip service. One of the more interesting aspects to the proposal is a new route for the Boston-New York stretch. Instead of the current shadowing of I-95, trains would follow the same highways that I take when I drive to New York, I-90 to I-91 to I-84 (though presumably these trains won’t take the Merritt Parkway). But then the route diverges sharply to the south and crosses underneath Long Island Sound in a tunnel before turning west again and continuing on to the city. I love this for so many reasons. This is something we’ll actually use, putting people to work, and producing a end-result we can all be happy with and proud of. Most importantly, it’s big-picture thinking. It’s ambitious. It’s grandiose. And it’s entirely in keeping with the American way. The students proposed a remade Market East station to accommodate the high-speed train stop in Philadelphia, with another stop at Philadelphia International Airport. They suggested keeping 30th Street Station for other train traffic and visualized a revitalized Market Street corridor between University City and Old City. The students proposed that federal and state governments pay for the new high-speed rail line for the Northeast, along with private investors. They suggested money could be raised from gas taxes, interstate tolls, user fees, value-added taxes, and station-area sales taxes. The economic benefits, the students concluded, would outstrip the costs by $70 billion. Yes we can, pretty please? 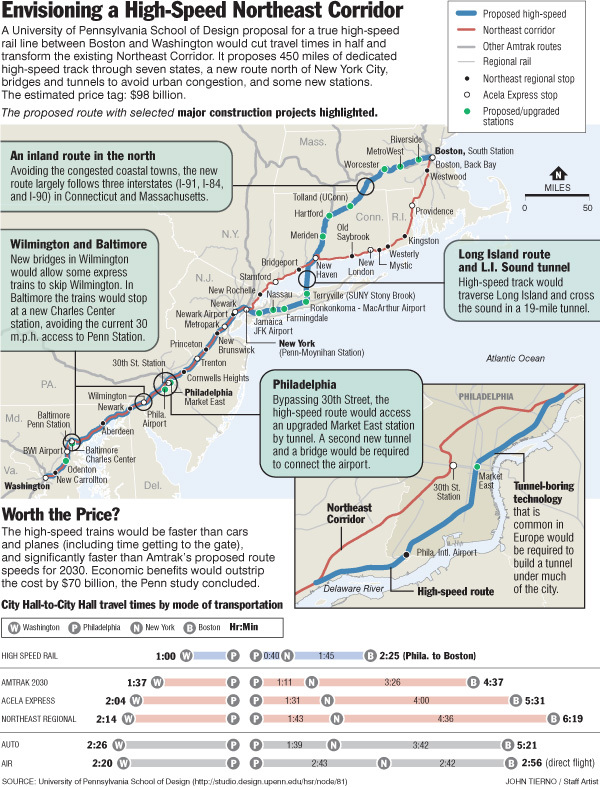 “They practically ignored the region of the country where high-speed makes the most sense – the Northeast Corridor,” he said. The corridor received $485 million, or 6 percent, of the stimulus funding. Traitors always end badly. As a rule, they end up in the gutter as drunks or drug addicts. 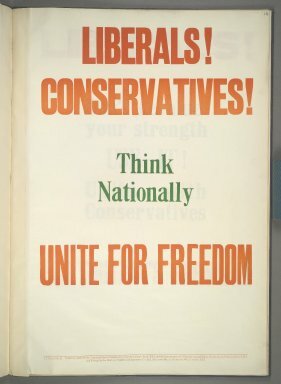 Take note, would-be Benedict Arnolds or Vidkun Quislings! If you commit treason, you might as well be heating up black tar heroin in a spoon. The Deepwater Horizon oil platform burns in the Gulf of Mexico. As per my standard operating procedure, I should be studying for my final final exam on Russia/Eurasia tomorrow morning but will procrastinate a little more (productive procrastination, that’s my motto). Instead, I have a number of thoughts to offer on the ‘British Petroleum’ spill in the Gulf of Mexico. And it’s worse than we can imagine. That is something which is a “Worst nightmare” conclusion to reach. All the actions and few tid bits of information all lead to one inescapable conclusion. The well pipes below the sea floor are broken and leaking. It means they will never cap the gusher after the wellhead. They cannot…the more they try and restrict the oil gushing out the bop?…the more it will transfer to the leaks below. It also means that the entire reservoir area is growing weaker and weaker underwater, and that (here comes the absolutely terrifying part) “fracturing and a complete bleed-out are already underway. Rumors also suggest a massive collapse of the Gulf floor itself is in the making” [emphasis mine]. This is the last post I’ll write on the subject (probably), but it makes for a good distraction from studying. The exam’s tomorrow. This is how I roll. Saif al-Islam Gaddafi's coterie of bodyguards and thugs at the London School of Economics, May 26, 2010. Libyan men protest the Gaddafi regime at the London School of Economics, May 26, 2010. Please distract me in any way possible; it’s only 16 hours until the exam. The attack of the other day is starting to get a little bit of play in the press. They all insist on characterizing it as a “brawl,” however. Last I checked, eight versus two is more of a beating. The Guardian praises Gaddafi as a reformer, and as that paper now routinely does, causes me to throw up a little in my mouth. The Evening Standard is a little more even-handed, but still fails to distinguish between the attackers and the victim. Most accounts, though, like the AP’s, focused entirely on Gaddafi’s non-answer to the question asked him about the Lockerbie bomber. “He is very sick,” was all he replied. Earned a PhD from the LSE in 2009, and wrote what must have been a mind-numbing dissertation on The Role of Civil Society in the Democratization of Global Governance Institutions: From ‘Soft Power’ to Collective Decision-Making? Donated £1.5 million to LSE’s government department last fall. Continues to claim the existence of any sort of functioning democracy in Libya. But as I arrived with my good friend the Hybrid Diplomat (who has his own account of the madness inside), there appeared to be a fight in progress outside. From what little I could tell, an older man, a younger, larger companion of his, and an LSE security guard were attempting to fend off what appeared to be 7-9 well-dressed men. In the end, they managed to throw the old man into the street, repeatedly kicking him, before they were somehow dispersed by the lone guard. And all this with a very large crowd just watching (I’m ashamed to include myself in that). 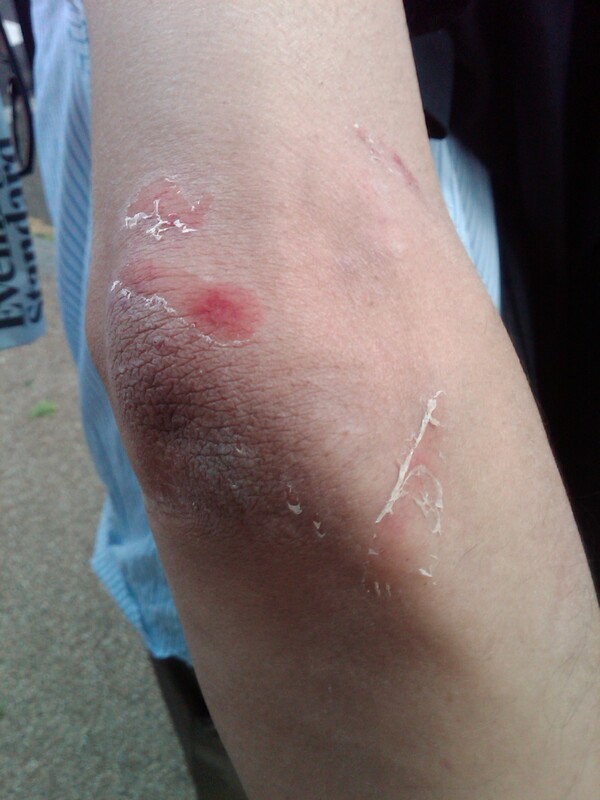 Fathallah, 58, shows his arm after being attacked in the street by Saif Gaddafi's thugs on the London School of Economics campus, May 25, 1010. He had been wearing a jacket; this is what happened through the fabric. I approached the man in the street, who introduced himself as Fathallah, 58 years old, and explained he was Libyan by origin, but was now living in London to escape from the death threats he faced at home. The men who’d beaten him were part of the younger Gaddafi’s coterie of around 40-50 Libyan men, who according to everyone I’ve asked, were essentially a planted friendly audience (scroll down) to Gaddafi once they got inside. But before they did, they managed to attack this man. Naturally, there were no police in sight. Usually when there are, they are there as protection for the speaker (see Danny Ayalon). But for once it was the protesters in need of that protection. At most, there were nine of them total, holding signs on the other side of Lincoln’s Inn Fields and chanting “down with Gaddafi!” They were unable to do so until the police arrived, but when they did, they did so in force. 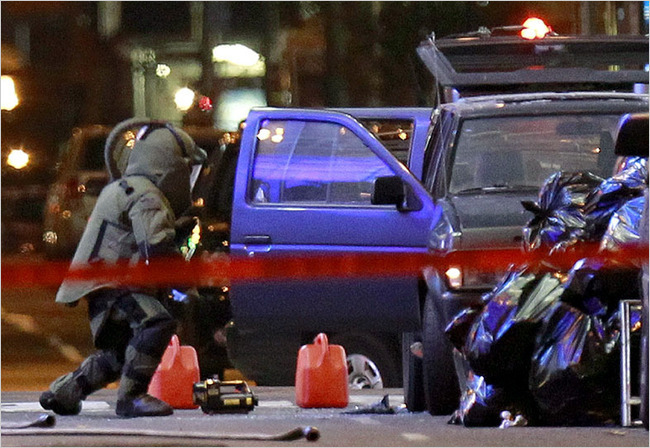 A police officer in a bomb suit examined a Nissan Pathfinder sport utility vehicle. If you haven’t been following, a pretty poor VBIED was found in Times Square today after a t-shirt vendor notified a horse cop that there was a smoking SUV parked at a strange angle. Quick evac of the area and speedy response from the NYPD. Turns out it was in the midst of detonating, but was shoddily constructed and thus never actually went off. Possibly a downside to open-source warfare, etc. : you can have the plans and the equipment, but actually following those instructions may prove difficult. Ever try to assemble something from Ikea? But so far, the reaction from Bloomberg and the NYPD has been pretty stellar. And no one is panicking a la the Pants Bomber. In this case, at least, failure as a strategy has proven to be no more than just a plain failure. He said that he was reluctant to speak with members of the media because they had twisted his words when they interviewed him in recent years. He got into the back seat of the taxi, took off his hat and used it to fan his face. Before he left, he was asked what he had to say to New Yorkers. “See something, say something,” he said.